Shorgul had the potential to be a great movie but it's a strictly one-time watch, feels Nabilah Husain. Like the title suggests, Shorgul is loud. It's filled with violence and political drama. A thought-provoking movie based ostensibly on the Muzaffarnagar communal riots of 2013, it shows that no matter what religion or caste one belongs to, it's a mammoth task to stand firm in one's beliefs, and that the majority of people are always swept away into a mob mentality and hence, lose their identity. It also shows that people tend to use religion for their own personal gains. Shorgul starts in an intriguing manner when a mysterious man meets an unidentified woman in the middle of the night. They exchange words and a concealed weapon is handed over to the woman. But the very next moment, an item song begins, which proves yet again that directors Jitendra Tiwari and P Singh prefer catering to the masses rather than focusing on the story. 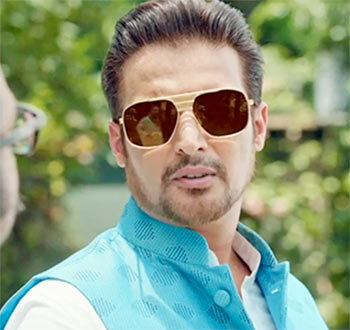 Om Prakash (Jimmy Sheirgill) is a corrupt politician, who pretends to provide for the majority but instead aims to take advantage of the chaos and establish himself as a minister. On the other hand, Alam Khan (Narendra Jha) vows to defend his community and warns that bloodshed will be inevitable if his people are harmed. Both characters show the radical mindset of Hindus and Muslims respectively. Ashutosh Rana, who is mostly known for his villainous roles, plays the good-natured leader Chaudhary, who sees the futility of conflict and strives to keep humanity intact, even when faced with severe circumstances. When his only son is murdered, his house is destroyed and his wife is murdered, he continues to preach non-violence. It's admirable but also a tad unbelievable. Amidst all this conflict is a love triangle between a local Muslim girl, Zainab (Suha Gezen), who is engaged to Salim (Hiten Tejwani). She finds out later that her childhood friend Arjun (Anirudh Dhave) is also in love with her. When the love story goes wrong and one of them is killed, the entire town uses it as an excuse to start a riot. Although the film attempts to bring up issues such as land acquisition, beef ban in Uttar Pradesh and suppression of the minorities, it just scratches the surface. One wonders why the scriptwriters even bothered bringing up these topics in such a superficial manner. Ashutosh Rana and Jimmy Sheirgill are impressive and play their roles convincingly. Newcomer Suha Gezen ends up overacting or crying in most of the scenes. She is the weakest link among all the performances. All in all, Shorgul had the potential to be a great movie but directors Jitendra Tiwari and P Singh seem lazy and incompetent.